My German friends, family and colleagues often get in touch when they are planning a trip to Scotland. “Where should I go?”, they ask. And since I’ve answered this question many times before, I thought it would be good to write down my ultimate Tour Scotland in Two Weeks Itinerary. There’s no way you can see in Scotland in two weeks, so pick what most interests you from the links I provide. I’m tailoring this to the places and activities that I think will most appeal to my overseas readers and that you’ll not find in every tourist guide. This is based on personal experience and so totally subjective! I’ll also add in any tips I get from friends, online and offline. There are amazing places not on my list, because they are slightly off my chosen route, or they involve longer drives and/or ferry trips (i.e. much of the far north, Shetland and Orkney etc). That doesn’t mean they aren’t worth visiting but if you go there, you’ll have to cross some of the other places off the list. Generally, my advice is to save the more remote areas for the next trip. I mean, you don’t think you can go to Scotland just once? If you decide you want to go further north on this trip, do ensure that you schedule enough time. The further north, the smaller the roads and what seems like a short 100km drive turns out to take several hours! We don’t have autobahns up here, folks. A word to motorways. We don’t have many in Scotland, and none that go further north than Perth. You’ll find some main routes are Dual Carriageways, with two lanes of traffic on each side. The main difference between these and motorways is that in many cases, there are no bridges or underpasses to cross traffic. It’s a bit scary sometimes because you are stuck in the middle of the dual carriageway, waiting for a gap in traffic so that you can drive off. The road up to Aberdeen is notorious for nasty accidents, as is the A9 between Perth and Inverness. For this reason, there are very strict restrictions on speed and many speed cameras, including ones that measure your average speed. Stick to the limit and watch out for crossing traffic on these roads. If I were you, I’d plan a couple of days in specific areas and do day trips in that area, rather than packing up and searching for a B&B every evening. 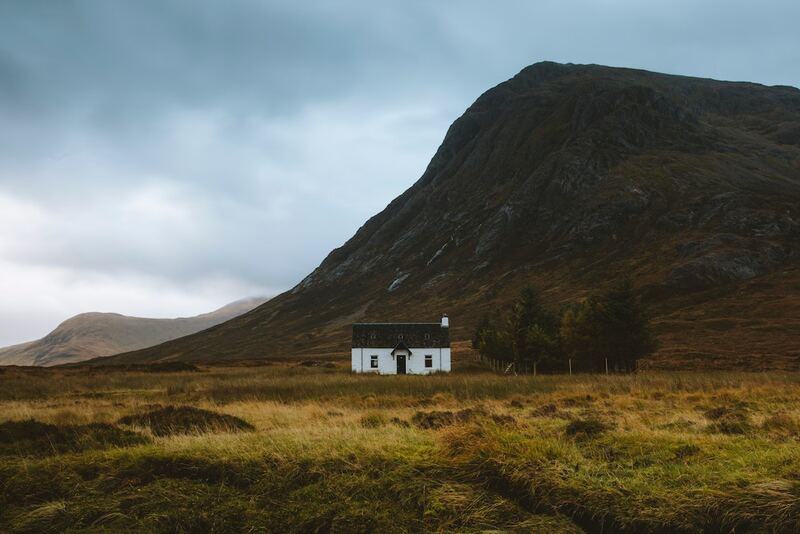 In the summer, you may want to book accommodation in advance, particularly if you are travelling with kids or a dog and in really popular areas such as Skye or Edinburgh during the Festival. Other times of the year, you are probably ok with looking for a hotel or B&B on the day of travel. Throughout the spring and summer months, Scotland has Highland Games in towns around the country. Just check the Events Calender of the Scottish Highland Games Association to find out which one is on when you are there. Some of them are quite small events, so go for the slightly larger towns, such as the Atholl Gathering in May and the Strathmore Highland Games in June, the Luss Highland Games in July, and the Crieff Highland Games in August if you want to see the full range of events. With all that said, let’s start the car and hit the road. I’m going to assume that if you are driving from Europe to Scotland, you’ll probably take the DFDS Amsterdam to Newcastle ferry. That’s the one I would recommend, not least because we recently discovered that you can book a dog-friendly cabin. I always hated leaving our dog in the kennel overnight, so this is a huge advantage. This ferry also gets you into the UK about an hour or so south of the England/Scotland border, so worth booking to save driving through England. The short crossing via Dover-Calais or the Channel Tunnel is a lot cheaper, but once you factor in petrol costs and an extra overnight stop, I reckon the longer ferry is worth the money. An alternative is the P&O Ferry to Hull, which means a couple of hours more driving but you could combine with a visit to York. If you fly to Scotland, then you’ll likely be starting at either Glasgow or Edinburgh. This choice will depend on which city your closest home airport flies to, but if there isn’t much difference in price then I’d go for Edinburgh because it’s smaller. We always try to get to Ijmuiden early. If we have time, we have a walk on the beach. Otherwise, we have Kibberling before getting on the ferry at the restaurant nearby. This is just a suggestion, and you can, of course, do things in a different order. I’ve tried to fit as much in as I can in a timeframe that won’t leave you rushing to see too much. For those who have more than two weeks to tour Scotland, I’ve added some extra suggestions for little detours. I’d suggest the east coast first for two reasons. First, it leaves the more dramatic areas of Scotland till later in the trip, so you’ll feel like you are building up to them. And also because getting used to driving on the wrong side of the road takes a bit of adjustment, and you can do that before you get to the really far north, with the narrow roads and passing places. When you arrive in Newcastle, you get a crash course in roundabout driving. It’s fairly easy to find the right road. Just look for the signs for NORTH or SCOTLAND. The coastal road A1 via Berwick upon Tweed is slightly faster but my favourite is the A74 via Jedburgh and Melrose. If you want to feel like you are really properly in Scotland, then this is the route for you. Stop at the Abbey Bridge Tollhouse Cafe at Jedburgh Abbey car park for a cup of tea and a bacon roll or drive on to Melrose to stretch your legs and check out the lovely little shops and cafes such as Apples for Jam and the impressive Melrose Abbey. Close by, you will find the Leaderfoot Viaduct. The home of Scotland’s most famous novelist Sir Walter Scott, Abbotsford House is close to Melrose. A ‘flibbertigibbet of a house‘, he called and it really is worth a visit, even if just for the library. Scott’s View is said to be one of the places where Sir Walter Scott liked to sit and reflect. Fans of Harry Potter should consider taking the coast road to Berwick and visiting Alnwick Castle, which was used for the outdoor scenes of Hogwarts (see the end of this post for more details). I’d suggest at least one night in Edinburgh, depending on whether you want to head straight there or spend some time in the border region. 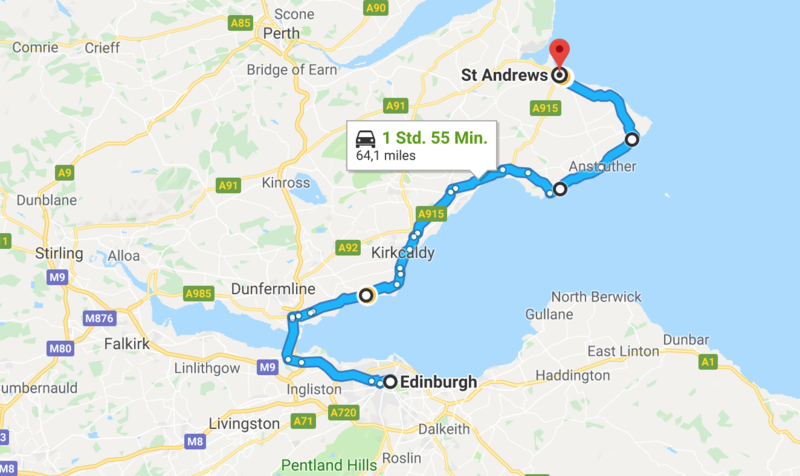 Edinburgh is only a couple of hours from the ferry so, in theory, you could be there by early afternoon and then head off the next day. You’ll probably want to spend more than a few hours in our capital city. The best (but most crowded) time of the year is August when the Royal Edinburgh Military Tattoo and the Edinburgh Fringe bring visitors from around the world. You’ll have to book early to get tickets for the Tattoo but you can decide fairly spontaneously which of the hundreds of shows you’d like to watch at the Fringe. Parking in Edinburgh is expensive, so you may want to use the Park and Ride at Straiton and avoid the hassle. A really lovely area of Edinburgh to stay is the rather hipster Bruntsfield, which is about half an hour on foot from the old town, through a large park called The Meadows. There is a fantastic German bakery in Bruntsfield called Falko for Germans who want to stock up on rye bread and brezels! Once you are in town, head down the alleyway behind the Apple Store to find Snax. It’s nothing fancy but you’ll get the best cooked breakfast made to order for well under £5. Heading north out of Edinburgh, take a quick stop in South Queensferry to admire the Forth Bridges before crossing the river estuary to the Kingdom of Fife. Drive along the coastal route via Burntisland and then take the road to Elie at Upper Largo. Elie is one of many little fishing villages along this stretch of coastline that is called the East Neuk. The Scots word ‘neuk’ is the same as the English word ‘nook’, a small corner. I’ve written a post about this area which is designed for a full day trip or even several days but you might need to choose just one village to visit, depending on how much time you have. If you want a walk along the beach, I’d head to Elie. For a cute little fishing village with wonderful little cafes such as the Cocoa Bean Cafe and Chocolatier (go here in autumn and winter for real hot chocolate!) and Crail Harbour Tearoom (with a stunning view), then Crail is your destination. Pittenweem has the feeling of an old-fashioned holiday village and is a good mix of the above. The Fisheries Museum in Anstruther is great with kids. You can get them excited about it by downloading the Minecraft version of the museum! Travelling with kids? Then don’t miss Cairnie Fruit Farm. It’s an adventure park for kids with a wonderful cafe, and lots of wholesome fun to be had. They have a holiday home on the premises too. A good place to stay in the evening is St Andrews, the home of golf and the first university in Scotland. There is a great selection of pubs and restaurants, and you mustn’t miss ice cream at Jannetta’s. Born in Dundee – Lemmings! Ok, so I obviously have to include this because I’m from Dundee but it really is a fantastic place. Not only for the recently opened V&A Design Museum. Set right on the Tay estuary, Dundee is really quite spectacular and getting better every year. The best scones in Dundee (well, in Fife really but we’ll claim them as ours) is Kitschnbake in Newport. Or head out to the Ship Inn in Broughty Ferry for a pint in a proper pub. With carpets! The food in the restaurant upstairs is pretty good, as is the nearby Fisherman’s Tavern. If you decide to stay a couple of days in this area and do some day trips from here, the Ship Inn has a lovely holiday home right next to the pub. If you stay an extra day in Dundee, then do drive up to Glamis Castle. Or take a drive through the Angus Glens – and have a walk in the hills. Loch Brandy at Glen Clova is not too strenuous and is a wonderful way to spend an afternoon. There are a number of shorter walks in the area for families with younger kids. Afterwards, have a drink by the fire in the Glen Clova Hotel. When we lived in Dundee, our weekend trips were often to Perthshire or to Fife. How lucky we were, to have two such amazing areas right on our doorsteps – it’s why I often advise visitors to base themselves in Dundee. The city of Perth is worth a visit, and if you fancy a wee walk, then head up Kinnoull Hill in Perth on your way past. A quick mention for the Italian bakery Casella & Polegato in Perth. If you’ve been in the UK for a couple of days and are starting to miss continental bread and rolls, then you’ll want to schedule a stop here. It is hands down, the best bakery in Scotland. 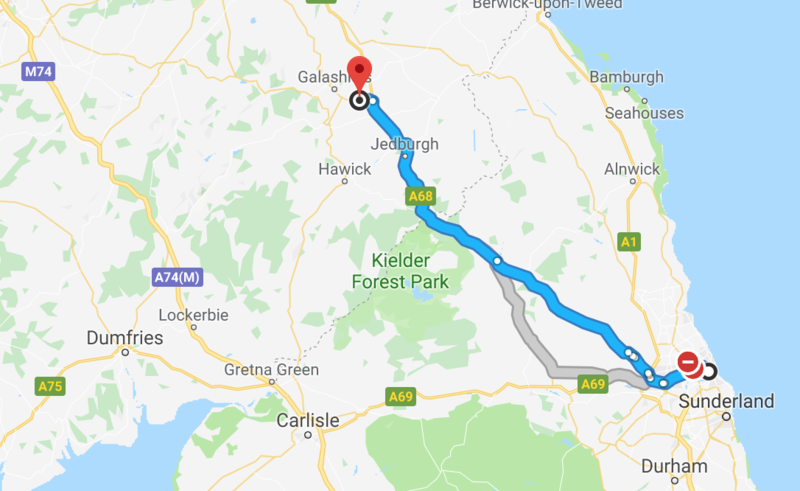 An alternative route takes you via Glamis and Coupar Angus, if you wish to combine some of the suggestions from the Dundee area with this section of the trip. Highland Perthshire is a bit like Highlands Lite. Not quite as dramatic as the hills further north but every bit as pretty and worth visiting. There’s a lot to see in the area, from little towns of Pitlochry and Dunkeld, the Highland Chocolatier in Grandtully to Blair Castle, the stunning Queens View. Whisky fans have the choice of visiting the smallest distillery in Scotland, Edradour. or one of the larger ones Dewars. Personally, I prefer the cosy little Edradour but I do have to admit that the visitors centre at Dewars is very well done and explains the process and history very well. There are also other distilleries in Highland Perthshire but I’ve not been to them yet! Check the individual websites for details of tours and age limits, as children are not allowed in most distilleries. 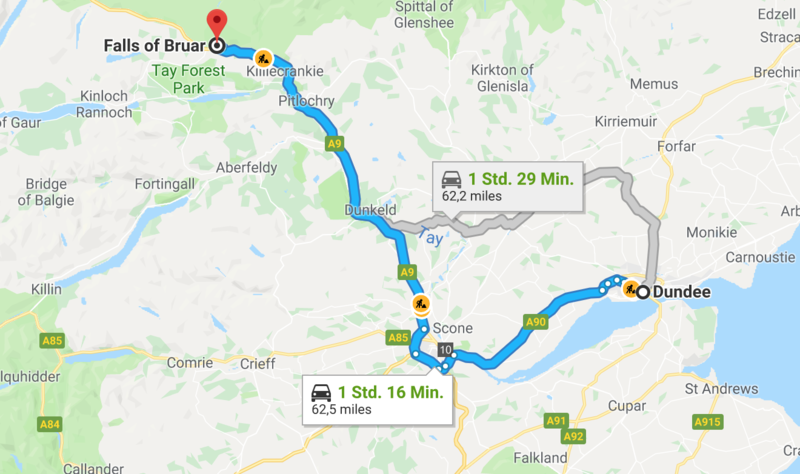 House of Bruar is something of a surprise – in the middle of nowhere, you’ll find this country department store with the best Scottish produce and goods. They sell everything from cashmere cardigans to smoked salmon and the aforementioned Casella & Polegato bread. A little expensive but worth the money for the experience is Highland Safaris in Aberfeldy. Jump in a Land Rover with your trusted guide and head for the hills. They also have a very cosy little cafe and Red Deer Visitors Centre. 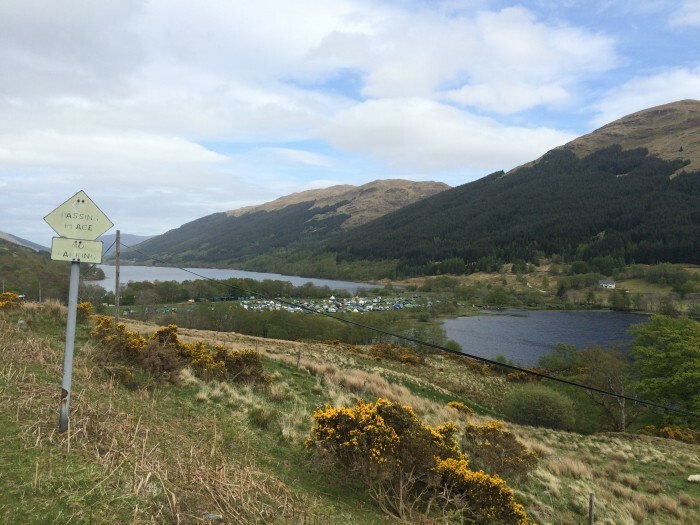 Head back to Dundee via Killin and Loch Tay – the Killin Hotel is great for meals in their cosy restaurant next to the open fire – or stop in Callendar for Fish and Chips at Mhor Fish. If you are getting short of time, you can take a shortcut via Crieff. Leave Dundee behind, as you travel through Blairgowrie up to Glenshee, one of Scotland’s ski resorts. The chair lift runs throughout the summer and it’s well worth taking a break here to go to the top. The views are quite spectacular. Onwards now, to Royal Deeside, so named as it has been a favoured holiday destination for the royal family since Queen Victoria had Balmoral Castle built. As the Queen spends August at Balmoral, you’ll not be able to visit the castle after the end of July. Don’t worry though, as there are plenty of other things to do in the area. There’s the pretty waterfall and walking route at Linn of Dee and the pretty little town of Braemar. If you happen to be in Royal Deeside in September, you might catch the Braemar Gathering, the Highland Games. The tug-of-war, tossing the caber and Highland dancing are just some of the events at this traditional event. Stop in Ballater for a wander or nip to Aboyne to check out the amazing Strachans grocery store, which is deceptively small from the outside but sells everything you never knew you needed! The Boat Inn in Aboyne is a nice wee hotel with a restaurant that uses local ingredients and traditional food with a modern twist. If you can’t visit the castle, you can still view the pretty little Crathie Kirk, which the Queen and her family attends, and Royal Lochnagar Distillery. Be aware that kids under the age of 8 years old are not allowed on the tour of the production areas. Take the route to Tomintoul where, in the wee village with just a couple of hundred inhabitants, you’ll find the world-renowned Tomintoul Distillery. Pass the city of Inverness and head towards Gairloch. We stayed in the charming little village of Badachro, where the Badachro Inn is worth a mention. 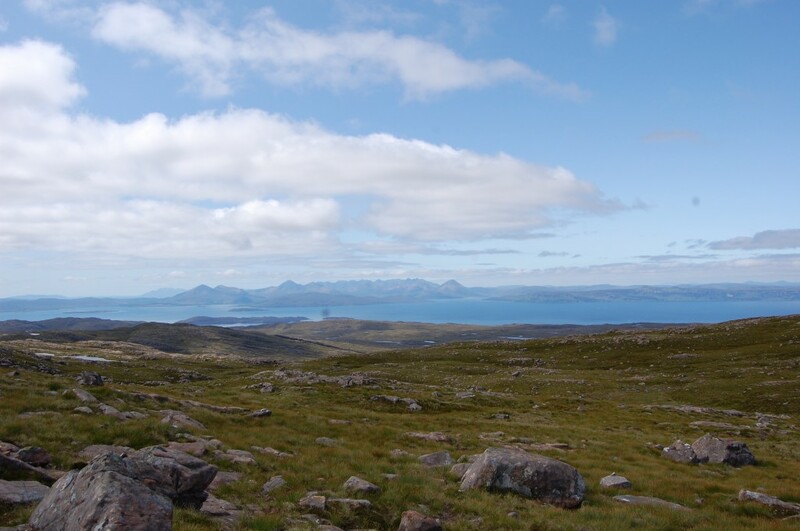 From Gairloch, you can embark on a whale watching cruise. We’ve reached our most northern destination on this trip and are now heading south. There’s still a lot to see and experience. We are saving some of the best for last! 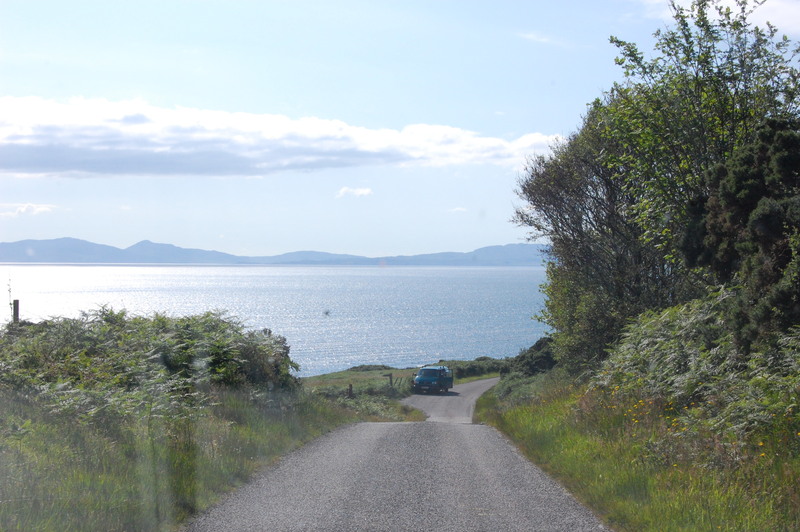 Today’s drive takes us in the opposite direction as the route I drove in 2011, from Gairloch via Applecross to Skye. There aren’t as many tourist destinations in this area, just the views to admire and the drive to enjoy. You can read about our trip to Skye here. It is one of the main destinations for visitors to Scotland so if you go in the middle of August, it will be busy. You should definitely book in advance. The best part of our trip was the visit to Dunvegan Castle and the boat trip out to see the seals but there are a whole host of boat trip options on Skye and you can easily spend a couple of days here doing various activities. 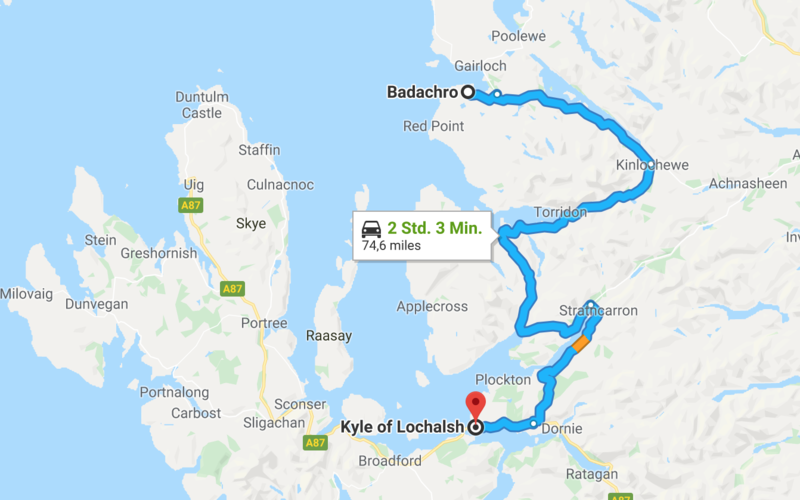 Now, this is a long drive but you could stop in Oban on the way, or not drive all the way to Tarbert. Either way, just relax and enjoy the scenery as you travel from Skye to Argyll. You can spend a couple of days in this area, doing some island hopping. I’ll some more suggestions later this year as we’ve planned a holiday in this area. One area that is so beautiful but relatively quiet, especially in comparison with Skye and the Highlands, is a hidden gem called Knapdale. We are coming close to the end of our holiday, so we head via Loch Lomond to Glasgow. Take a break in Luss on the way past or go gift shopping at Lomond Shores. For kids, the treetop adventure at Loch Lomond is great fun. Glasgow isn’t quite as touristy as Edinburgh and often overlooked but it has a lot to offer. From a buzzing shopping centre (the Princes Square is really quite lovely) and a host of art galleries and museums, from the spectacular Burrell Collection (but not till 2020 as it’s closed for renovations) to the fun People’s Palace that tells the stories of generations of Glaswegians, and the Glasgow Science Centre, there’s something for everyone. And of course, no trip to Glasgow would be complete without a visit to at least one Charles Rennie Mackintosh attractions. If you like Italian food, then try out Fratelli Sarti. In the past years, Glasgow’s cafe culture has transformed with a whole host of new cafes and tea rooms. I’ve bookmarked Cup and Laboratorio Espresso to try out this summer. Insider Tip from Twitter : My secret pick for Glasgow is Sharmanka, a kinetic theater. It’s time to head back to the ferry, and this time I’m sending you via Berwick. You can, of course, switch this with the one via Jedburgh if you’d prefer to spend more time on this route. For Harry Potter fans, Alnwick Castle will be instantly recognisable as Hogwarts. At least for the outdoor scenes. 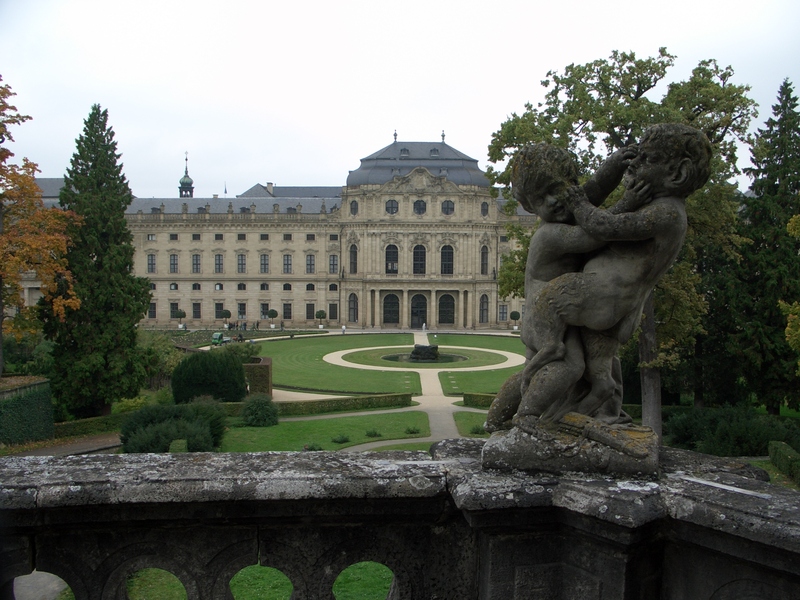 It is quite expensive but both the castle and the grounds are quite spectacular. The village of Alnwick is quite pretty and a special mention to the most fabulous of second-hand bookshops Barter Books. A wonderful experience is the Holy Island Lindisfarne – which is reached via a causeway when the tide is out. DO NOT attempt to cross outwith the advised safe times unless you fancy being rescued by the coastguard. You are in Scotland longer than two weeks? Then here are some extra trips that you can add in to your journey. Or spend a few extra days in whichever area you find particularly enjoyable. The little village of Portpatrick, the delightful Otters Pool at the Raiders Road, the lighthouse and RSPB (Bird Sanctuary) at the most southernly point in Scotland, Mull of Galloway, the amazing Logan Botanic Gardens… there is so much to do in this beautiful part of Scotland, which most foreign visitors drive right past. And if you are lucky, you’ll see some Belted Galloway cows. Aviemore and surrounding area is the second largest skiing area in Scotland. The funicular railway to the top of the Cairngorm mountain range offers amazing views over Loch Morlich and Rochiemurchas forest. (Check before you go though because at present it’s closed for repairs). Don’t miss the little cafe in Glenmore next to the campsite for the best Apfelstrudel outside of Austria and the rustic Pine Martin Bar. Not fancy, but cosy and welcoming. The Cairngorm Reindeer visitor centre is a lot of fun, not just for kids. The Strathspey Railway is a steam train that through Strathspey. I haven’t tried the Afternoon Tea yet, but it’s on my list! The sweet little town of Carrbridge is home to the oldest bridge in Scotland, and isn’t quite as busy as the larger Aviemore. In the area is also Boat of Garden. I’m planning a trip to Scotland this summer so I’ll add new tips and photos then. Until then, if you have any questions, get in touch with me on Twitter.